Commercial Interior Design Services. — Interior Designer: Interior Design Bath, Bristol, Somerset, Wiltshire & London. interiors.family offers a flexible Interior Design service to commercial clients. We fully appreciate the need to communicate your brand through your interiors. We aim to deliver creative, beautifully finished yet practical interiors which clearly represent your brands unique identity, helping you stand out against the competition. The Colombian Company - Bath. Floor plans, elevations & 3d visual (top right). Click on the image to see more. 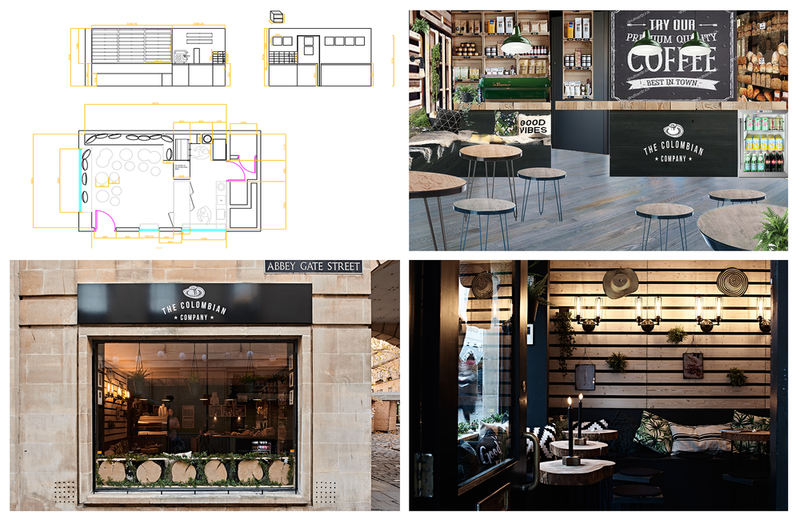 Good Day Cafe - Bath, layout and design. Click on the image to see more. We love working with independent owners & as a small company we can tailor our services to meet your specific requirements..
Services range from a 2 hour consultation to generate a few ideas to a full refurbishment requiring a project managed service from concept to completion. We are passionate about what we do, each project large or small is carefully planned with meticulous attention to detail to maximise the potential of your business whilst creating unique spaces which you will love. No matter what size of budget we are working to, we put in a lot of thought & planning to ensure every penny is used in the most effective way. We are also able to utilise our sourcing expertise & trade discounts to deliver significant savings, helping with project costs. Please do contact us if you would like to discuss your project & how we can help you, we are more than happy to answer any questions. We have mapped out the design process below, so you know what to expect at every stage in the project. Please call us for an initial conversation so we can begin to gather key information regarding your aspirations, timescale & budget. The next step is to send out a client questionnaire which will form the basis of the design brief. We can then arrange a free, no obligation meeting on site which normally takes 2 hours (if you have completed the questionnaire). The first meeting offers a great opportunity to understand your brand & business plan, to listen to your practical requirements, ideas & objectives. We can also discuss any design preferences & go through any inspirational images you may have collected. At this point we will also take some basic measurements & photographs. All the information we gather will be added to the comprehensive brief. Based upon the brief we will prepare a fee proposal which outlines the scope of work & the services to be carried out to meet your requirements. Once our fee proposal has been been accepted we move on to the next stage where we develop a bespoke design tailored to your business. We carry out a detailed site survey & a full analysis of the internal space, reviewing & improving layouts as part of spatial planning. We also begin the process of drawing up furniture layouts including any bespoke joinery or furniture. 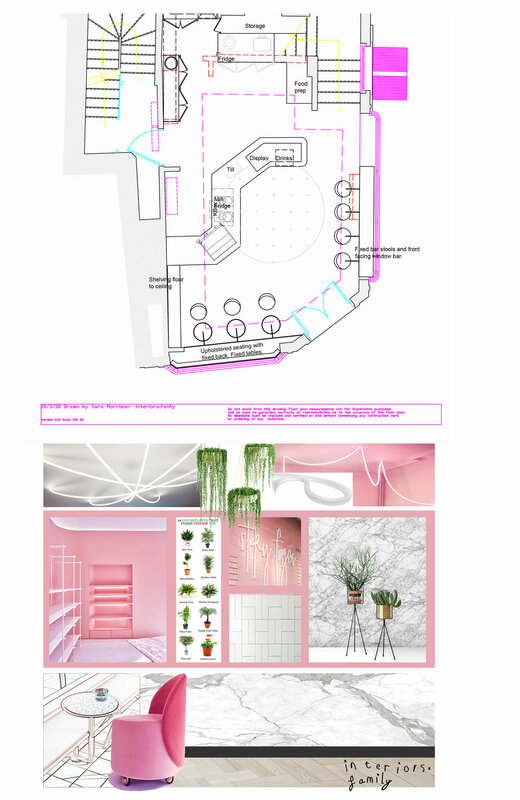 We present our ideas using a range of visuals such as scaled floor plans & elevations, 3d room visuals, sketches, digital mood boards, fabric samples, hard finishes & conceptual images to enable you to visualise how your business space will come to life. A few appointments may be necessary to complete this stage depending on the size and complexity of the project. Once the concept has been approved we finalise all the drawings necessary to implement the design scheme. These drawings can also be used to tender quotes from a range of contractors & brief specialist trades. For every area we produce fully detailed CAD scaled floor plans, elevations of wall.. Electrical layout & lighting plans are finalised, bespoke items such as fitted cupboards, joinery are completed taking care of the finest details. Alongside the drawings we will also provide a comprehensive specification of all materials, wall & floor finishes with samples & supplier details. We produce a detailed sourcing list for each area which specifies every item of furniture, fabrics & window treatments alongside images, with sizes & suppler details. At the end of this stage you’ll be presented with a complete design pack enabling you to implement the design yourself should you so wish or we can coordinate your project to completion. This is the stage where we ensure that the approved designs are fully implemented on site. We liaise with site contractors, consultants to ensure the design concept is executed accurately & to the highest possible standard. Our aim is to turn the design into a beautifully finished interior. We will be on site regularly to monitor progress & provide problem solving solutions when necessary. Our service also takes care of the administration involved in implementing the sourcing list. We will place & progress all orders, liaise with suppliers, coordinate production dates & deliveries right through to installation. The final part of this stage is where we style & accessorise your space with all the finishing touches ensuring the space represents your brand. As every project is unique our fees are based upon the size of the project & the level of service or involvement you require. We always send a detailed estimate following the briefing meeting. We think good design should be accessible to all, so please don’t hesitate to call us for a chat. We will happily advise the best way forward in terms of your budget and help define which of our services you may require.